Sclerotherapy is the treatment of choice for the thin leg veins called telangiectasias. Telangiectasias are small caliber vessels (venules) that have been permanently distended and are visible on the surface of the skin. Their diameter measures a few millimeters. Usually they do not cause any symptoms, but they raise aesthetic concerns, especially in women. Sclerotherapy is a treatment method that consists in the intravascular micro-injections of sclerotic agents that damage the wall of the thin distended venules. A fibrotic reaction follows and eventually the venule is resorbed and is no longer visible on the surface of the skin. A very thin needle and multiple puncture points are used for this procedure. 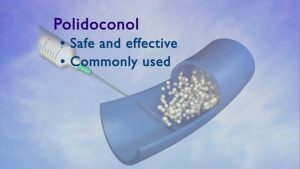 In our practice we use the safest and most effecting sclerosing agent – polydocanol (Aethoxysclerol). Treatment is usually performed in multiple session, each one lasting for 30 to 45 minutes. At least four weeks are required after each session for the resorption of treated venules. Clearance of the telangiectasias is observed gradually. The treatment is preferably performed in the cooler season, as patients usually have to wear compression stockings for at least two weeks after each session. In general, sclerotherapy it is a well tolerated treatment with a high degree of satisfaction.